The Cups and Balls effect is one of the most recognizable tricks in magic! Many professional magicians make the Cups and Balls the highlight of their performances, and for good reason. This trick is a true classic, a real audience pleaser. And this is a true professional quality version! Three cups, three balls. Make the balls appear and disappear, travel from under one cup to another- many, many routines! Easy to learn, but so amazing to see. 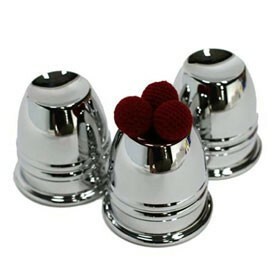 And this set is made in perfectly weighted mirror-polished chrome metal. 3.75" tall. Gorgeous to look at, delightful to work with! The cups stack perfectly on top of each other, giving you that extra "edge" in performing the more complex Cups and Balls moves.